We’re a bit headphone-crazy around here, and we’re sure that some of you out there have a nice collection of over-the-ear cans yourselves. As you know, these larger headphones (sometimes referred to as Circumaural if you want to get technical) often have the best sound quality around, but how to store them can be a problem. 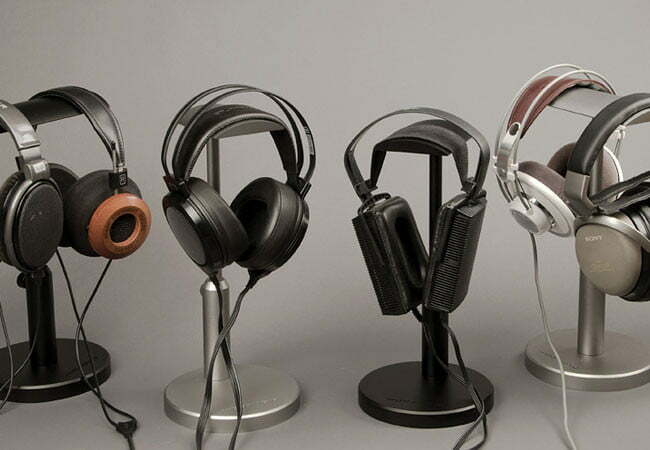 You may not ever take them out of your office, but if you’ve got multiple pairs of high-end headphones, chances are you end up just throwing them on a shelf or in a drawer without second thought. Be a little kinder to your expensive audio gear and give your headphones the royal treatment with Woo Audio’s Aluminum Headphone Stands ($60-$75). These solid aluminum stands (available in either black or silver) give your headphones a sturdy and elegant place to rest while not in use. Buy a few of the stands and you’ll have a gallery-worthy display for your home or office. The stands are available in designs for a single pair of ‘phones or two pairs, and the wide headband hanger distributes weight evenly and keeps your headphones looking and feeling as good as they did right out of the box. The stands include rubber feet to protect surfaces and can be adjusted from 11″ to 14″ depending on the size of your headphones.